Our neighbour brought us this photo a few days ago, it's our garden sometime in the late seventies. You can tell from the landscaping. This is pure Percy Thrower gardening that leads to rockeries and vegetable patches tucked behind sheds. 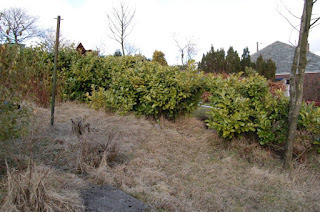 You can just make out this old vegetable patch behind the brown shed in the centre garden. That's us. That's a garden long gone. There is some sadness about this, all gardens reflect their creators, and this was Norman's garden, the man who owned this house with Dorothy before us. When we moved here in 2009, there were still echoes of his garden, three decades later. 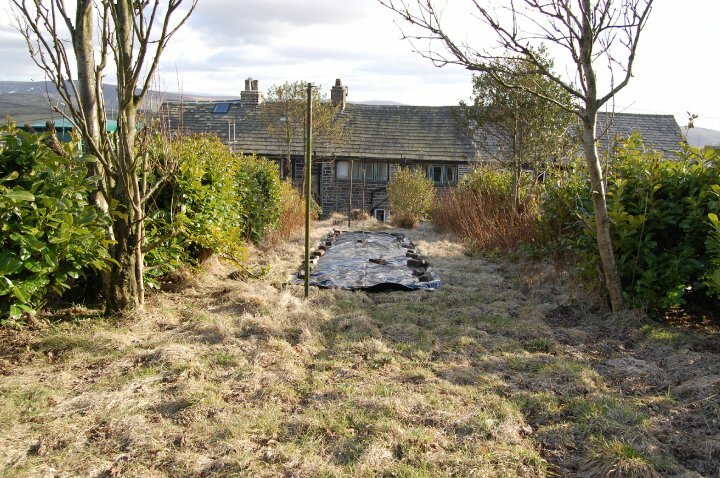 We know even prior to this photo that he had abandoned over half of the garden to the north, just cultivating half the plot and letting the rest run to bramble and rosebay willow herb. We spent two years fighting it. 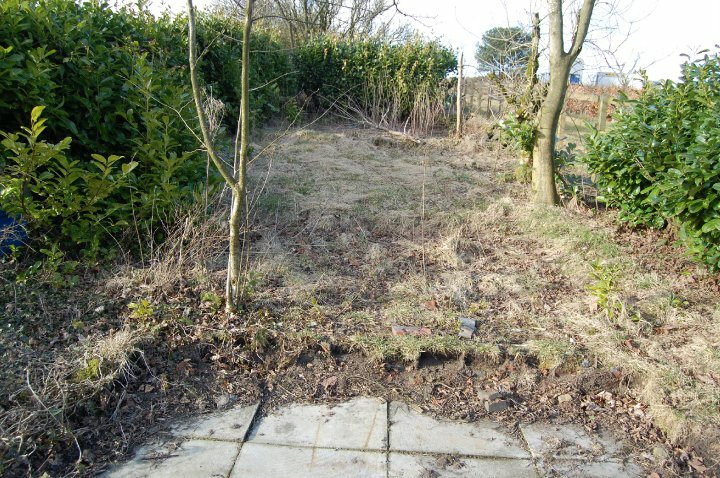 Let's look back, ten years after we changed this hillside to see the echoes of a garden gone. We're digging up the past. These paving slabs held the shed that sits in the garden above. We know this was a shed because when started clearing around it we found the debris that accumulates in a shed, old jam jars and tins full of nails, a box of lead soldiers and old bottles of chemicals that we carefully disposed of. The shed had blown down two years before we arrived, removed by neighbours, who in their turn, have moved on who told us that a shed stood there and that it was old and leaning, and rotten. Then there is the biggest tell tale clue of the old garden, the washing line posts that stretched up the hill. They were still there when we moved in but where already succumbing to metal fatigue as most of the posts were full of brackish rain water. One of them bent over when we hung out our bed sheets and the rest didn't last being put back into use. We have one left in the lower terrace, a sentinel to those that fell under heavy quilts and baby clothes. Even the old concrete path popped up here and there from beneath the thatch that had drowned it. There are trees on our photos that were not here in Norman's time, showing how fast Ash invades and grows. It is the red bricks in the photo below that reveal that old garden's vegetable patch, and funnily enough with no prompting it was our's too that first year. You can see me relaxing in that knackered way of just having cleared thirty years of brush, brash, thatch and thorn from the patch as Little D just did what he did back in summer of 2010...sleep. Now he jabbers. And jabs. What amazes me as we move through Norman's garden is not the Percy Thrower borders or the concrete path but the rockery that sits closest to the house and which holds me dread. At present, this part of the garden gives way to a small ginnel that leads to the house from two tiered beds. As if these beds are hiding something. There are odd formations in the lowest of the terraces, lime stone pokes up like dinosaur teeth, and lime stone was such a favourite of the fifties rockery garden. It's probably the first garden that Norman grew after he returned from war, it was probably his pride and joy as he slowly, like us, reclaimed the land. There are always echoes of gardens that have gone before and even our's has changed from that first year where we seemed to tap into the footprint of that old garden and place our beds like Norman's.